Half a world away, I have read, watched, and listened to the debate over gun control in the United States, dismayed by the rhetoric and disturbed at how two hyperbole-fueled extremes frame the discussion. That distance, I hope, has made it easier for me to step back and consider the subject. As an attempt to add my two cents’ worth to the public discourse, I would like to share some conclusions I have reached. I do not expect everyone to agree with me and I welcome constructive comments. Just a forewarning: comments that are not constructive, that rely on name-calling or otherwise do not contribute to a civil discussion, will not be entertained. Many of my friends and family members are gun owners and people who enjoy guns recreationally. While my first-hand gun experience ended with BB guns in late primary school, I recognize the appeal of guns and do not think that guns are inherently bad. I think we need to look at this discussion through the lens of “gun safety.” Our individual right to bear arms must be balanced with the right of all people to life, liberty, and the pursuit of happiness. The Second Amendment clearly states that people have a right to bear arms. Our courts have already confirmed several abridgments to those rights, though, for example limiting the types of weapons you can own (no nuclear or chemical arms – too many innocent bystanders harmed when you use them to protect your life or property). 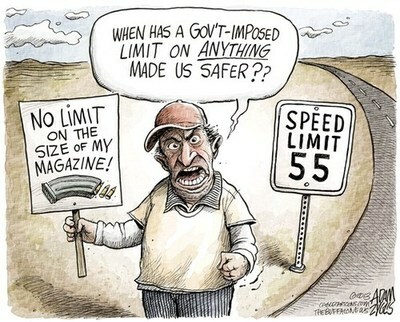 Legitimate limits are placed on our constitutional rights routinely. My First Amendment right to freedom of expression is tempered when the safety of the larger public is affected. I cannot incite a crowd to violence. I cannot expose state secrets. I cannot shout “fire” in a crowded movie theater. The safety of the general public is a compelling reason to place some restrictions on our constitutional freedoms and I think this can be done in a way to balances those competing interests without unduly infringing gun owners’ rights. Require criminal background checks for all gun sales, including those by private sellers that currently are exempt. Increase criminal penalties for so-called “straw purchasers,” people who pass the required background check to buy a gun on behalf of someone else. Fund research by public health agencies into deaths and injuries caused by firearms. Some members of the gun-rights lobby make the claim that criminals do not follow laws, therefore any gun safety legislation we pass will harm only law-abiding citizens. This seems to imply that we should not bother setting any laws about anything, because criminals will break those laws. The setting of speed limits and the passing of laws requiring seatbelt use do not ensure that nobody speeds and everybody wears a seatbelt. These laws have resulted in a reduction of deaths and injuries and provide a basis with which to prosecute those who break the law. Universal background checks would work in much the same way. They will not prevent all gun violence – the Newtown shooting, for example, might still have happened. Currently, it is estimated that between thirty and forty percent of gun sales happen with no background check. (These would be private sales, gun show sales, etc.) Universal background checks will place an additional barrier in the way of people with criminal records or a history of mental instability, making it more difficult to get a weapon with which they can do great harm. Conducting background checks on private gun sales and increasing criminal penalties for “straw purchasers” could help stem the flow of guns into the criminal underworld by closing potential loopholes. Many people purchase guns for personal protection. Making it more difficult for people who should not have guns, to obtain them, should help increase everyone’s safety. Having a right to bear arms does not inherently give you the right to privacy when you purchase a weapon. Universal background checks would go a long way to ensuring that the people who purchase guns are law-abiding. On the issue of funding research, there is much we do not know about the causes and effects of gun violence. Congress (at the urging of the National Rifle Association) has routinely cut funding to the Centers for Disease Control and the National Institutes of Health when the results of studies they undertook demonstrated a need for gun legislation. In fact, despite more than four million gun-related deaths and injuries in the United States over the last four decades, the NIH has awarded only three research grants on the subject. Compare that to diphtheria, which has caused only 1,337 deaths in those four decades but for which there has been more than 50 NIH-funded studies. Even influenza, which regularly kills fewer people each year than gun violence, receives much more research funding. Effective legislation can increase public safety and it needs to be based on empirical evidence. Some things we should better understand, as outlined in a recent Atlantic Cities blog post, include whether magazine limits actually work, who should be excluded from owning a gun, and whether there is a relationship between levels of gun ownership and levels of crime. Among the proposed legislative actions that I do not think we need to take are reinstating the assault weapons ban. While I do not see a need for anyone to own an assault weapon, that’s the purview of an individual gun owner or collector. So long as he or she is law-abiding and undergoes a background check, it does not matter to me what kind of gun is purchased. Without a doubt, this debate will continue. It is fueled by loud voices and, especially in the case of the National Rifle Association, a lot of money. However, I think it behooves each of us to try to move beyond the hyperbole, gather facts, consider our own values, and then add our voice to the discussion – especially by letting our legislators know what we think. Well, that is my opinion on the matter. I welcome your comments and remind you that only constructive comments will be entertained. The First Amendment does not prevent me from squelching name-calling and uncivil discourse! This entry was posted in Uncategorized and tagged control, debate, gun, legislation, politics, safety, violence by christao408. Bookmark the permalink. Agreed on the background checks. This is way too sane. As a non-US citizen always having lived a half-world away all his life, the gun control question always seemed strange. I know no other modern and “civilized” country that allows its citizens to be better armed than a Swat team. What is most interesting in this entire context is the claim by some groups to refer to thr constitution and suggest to follow it to the letter. Wouldn’t it be only normal to argue that a document written over 200 years should be viewers through modern eyes? The circumstances under which it was written are simply no longer there. My personal opinion on gun control is that it would reduce the “shooting by accident” not the gang killings, not the massacres. But you wouldn’t have young kids shooting each other by playing with daddy’s gun or the domestic violence turning deadly because a gun was in the drawer. It seems plausible to me to leave the monopoly of power in the hands of the government. I appreciate this well thought out and rational look at this difficult issue – well done. I agree with you on all counts, except I do believe there should also be a limit on assault rifles. In my mind, the argument you used re: First Amendment limits related to general public safety applies to assault rifles. Their ability to injure so many more people in the blink of an eye sets them apart in my mind. (And in my heart, as the mother of young kids.) Great post. You’ve obviously gave this entry a lot of thought. I think some people confuse the right to own a gun with the right to do whatever they want with a gun. They forget about being a responsible citizen and accountable for one’s actions. this is a well done post chris. i’m glad to see stuff like this in lieu of the loud voices we have on either side. personally, i don’t think heavy gun legislation will improve anything. if anything, i believe the gun “problem” we have is a natural outgrowth of the loss of civility stemming from an ever scrutinized standard of living. Well thought out presentation. I ma not sure the 2nd Amendment refers to the individual or to those in a state who are there to protect the state from invaders. I believe it was written at time when The British were coming and each state was given the right to arm it people to protect being invaded. I am not sure where the solution lies – certainly,in my mind, with your suggestions. I fear in the USA we become a people who shoot first and ask questions later. How do you challenge a mentality. I feel threatened so I shoot you. My neighbor as a permit to carry a concealed weapon – recently procured. He has rifles in his home. We live in a quiet retirement community. Does he the permit? I am an expert marksman rating but at this point there is no gun in my house nor will there be. I am rambling, sorry. Thanks for your incites. Excellent well thought out post. I agree with you on all things except the assault weapon ban. Is there a way for you to propose these answers to the officials there? Good post! I too would like to see this worked out in today’s world. Ever heard of the gun fight at OK Corral? If so, I imagine that you know that in the good old days of the western frontier in Dodge City the gunfight was over following the rule to drop your gun off with the local sheriff if you wanted to be inside the city limits.The USA is a gun culture! We own, manufacture and sell the bulk of the weapons for the world. To me the number of guns in a society equals the degree of civilization, more guns less civility. We are becoming uncivilized. 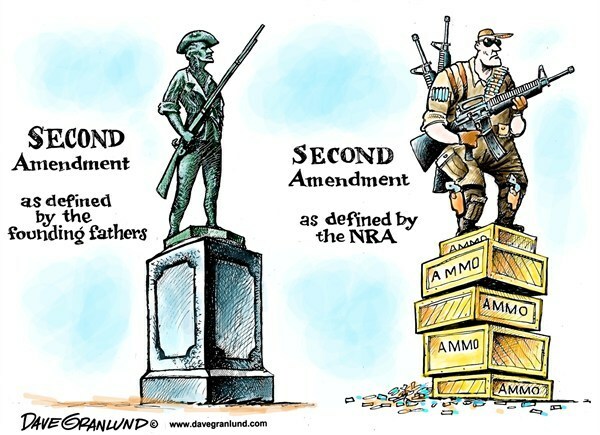 So far the NRA members and TEA’s have not found your post, when they do I expect your will be bombarded with many posts, most of them unfounded and direct from the NRA or a similar gun organization. Gun control is a good idea. I own several firearms and laws are needed to protect me from myself. It is required in NYS that firearms are sold with trigger locks. These help prevent accidental shootings. One exmple of good gun control laws. I would never suport a ban on gun ownership, but I do understand the restrictions on when and where you can go shooting your gun. We are not permitted to discharge a firearm withing 500 feet of an ocupied structure or dwelling without the consent of the owner of that dwelling. That make good sense espcially in densly poulated areas.Gun controll can be very beneficial, as long as it is crafted intelligently. Brave man. 🙂 I have debate this in my head too. I am not anti-gun but want something done to ensure more safety. I appreciate this post. I have American friends who are at constant loggerheads on this matter, and viewing this debate from a foreigner’s lens, there is a problem with extremes. It’s either everyone has a gun or none at all. I am not pro-gun, but responsible ownership is good. Great post! Ditto on the need for more research. A slight quibble: my understanding is that the NRA objects to funding research not so much because it shows a result they disagree with, but because they take the whole notion of a public health-oriented approach to gun violence as suggesting that gun ownership is “unhealthy.” Which is totally simpleminded and ignorant, but not as venal as one might think. Your proposals are reasonable, Chris.It may boil down to how much one trusts the government to protect its citizens and not oppress them. I for one, find it difficult to feel that trust. I have to say I appreciate the tone of this post though I do not agree with all of your points. Most oftentimes the posts I see suggesting what you are here have been based on emotional, gut-reaction arguments with personal attacks. Rather than a logical approach. So for that, thank you.”Some members of the gun-rights lobby make the claim that criminals do not follow laws, therefore any gun safety legislation we pass will harm only law-abiding citizens. This seems to imply that we should not bother setting any laws about anything, because criminals will break those laws.”I will often bring up this fact that gun control laws only affect law-abiding citizens. Which is why I think we need to be extra careful when passing such measures. The criminals are already not going to obey. I’m not trying to infer that because of this, no laws should be passed. But we don’t want to pass bills such as the one that Senator Feinstein brought to the table that would ban all types of assault weapons merely because of their appearance. Such a bill only takes away weapons from folks like me who are never going to break the law.As for additional background checks, unfortunately, even with the new proposed checks they would not have caught Adam Lanza. He stole his mother’s weapons. Which is often the case for criminals. They often steal weapons or purchase them on the black market. I’m not against background checks in general. But I do not think we should create excessive hoops for law-abiding citizens to jump through either. I don’t like the idea of having to pay for a background check for someone just so I can sell them my gun. I think the discretion of who a private seller sells to should be theirs alone. Just like if I were to sell my car or anything else.In all honesty, I do not believe the answer to our gun related problems lies in the guns themselves. But rather we have a people problem. I’d like to see more research done on the dangerous psychotropic drugs that doctors have been prescribing everyone and their brother. I think there is a lot of work that needs to be done in the mental health field. I was also reading an interesting article from Mother Jones giving a very probable explanation for why crime rates have been falling over the past few decades due to our switch from lead based fuel to unleaded. If lead is indeed affecting people to act violently, which it sounds like it is, I wonder what other environmental factors may be at play. @firetyger – Certainly okay for us not to agree on this subject and I, too, appreciate your constructive tone. Your point about Sen. Feinstein’s proposed assault weapon ban is one I agree with. I also agree that Adam Lanza would not have been stopped by background checks. 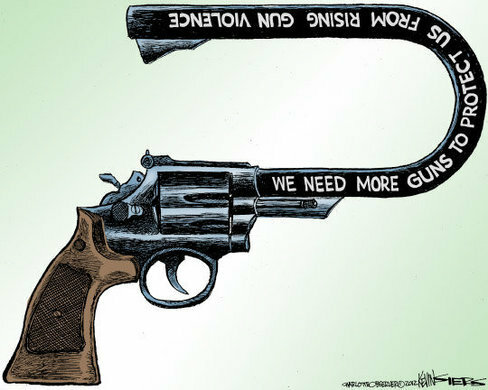 The idea isn’t that everyone would be stopped, but that by increasing background checks, we can at least reduce some of the leakage of guns into the hands of those who shouldn’t have them. You have my full support that we don’t want the make the background check process unduly burdensome. There should be a way to strike a good balance. Finally, I fully agree that we need to also look at the root causes of violence. There are other nations with high levels of gun ownership that don’t have nearly the gun violence we do in the US. We need to figure out why and try to treat those causes. Thanks again for being a part of the conversation! @Inciteful – That’s a really good point. The US certainly has a history of not trusting government and that’s one reason why I think we should continue to allow gun ownership. Proposals to ban all guns fly in the face of our history and culture. That said, I hope we can take steps to reduce the incidence of guns getting into the hands of people who would use them to harm others rather than to defend their own rights. @n_e_i_l – Your more detailed explanation about the reasons for the NRA’s resistance to research may be right. I confess, in the interest of keeping this entry to just about 1,000 words, I had to edit and one of the areas where I cut was in my explanation of the history of the NRA’s attempts to suppress research. Thanks for clarifying. @theboneofcontention – The US is certainly a country (perhaps thanks to our media and media consumption habits?) where the extremes get all the attention and the large area of at least some common ground is left out of the discussion. I suspect that the vast majority of US citizens agree with me on the point that there is a way to strike a balance between the rights of gun owners and the safety of the general population. We may have to quibble a bit on the details, but should be able to reach a general understanding that most of us can live with. The problem is, extreme voices on either side don’t want to compromise. @Ikwa – Yes, I realized that writing this would potentially put me out there. That’s one reason that I spent a lot of time thinking carefully and trying to challenge my positions. I wanted to try to think as inependently as possible rather than regurgitate the arguments that I’ve heard on this debate. @Aloysius_son – Thanks for bringing up the point about trigger locks. There really are a lot of small measures we can take that drastically improve the safety of guns without having any negative consequence on the rights of gun owners. @vexations – The one point I might disagree with you on is the idea that more guns equals less civility. If we use gun violence as a proxy for less civility, the statistics don’t bear that out. Countries like Finland, Sweden, Serbia, Switzerland and Cyprus all have relatively high levels of gun ownership. Granted, not as high as in the US, but when controlling for the difference, their rates of gun homicide are still less than half that of the United States’. The countries with the highest gun homicide rates – Honduras, El Salvador, and Jamaica – have gun ownership levels that are less than one-tenth that of the United States’. Rates of gun ownership don’t necessarily correlate with the levels of violence. Source @nov_way – My two senators and one congressman have already heard from me about what measures I would like them to take. Unfortunately, all three of them seem to be in the sway of the NRA and are convinced that no level of gun safety legislation is necessary. @awoolham – @turningreen – Originally, I felt that an assault weapon ban was necessary, as was a limit on high-capacity magazines. They lie on that borderline of being a weapon that, like chemical weapons, can cause a lot of collateral damage. But, in the hands of a law-abiding gun owner, they are safe to use. If we have a solid system of background checks, I’m comfortable with law-abiding people having and using assault weapons. That said, I respect that many people disagree with that opinion. @Fatcat723 – The laws that allow a person to shoot first if they feel threatened strike me as problematic. The recent case in Florida is an example of where fear and/or prejudice can have deadly consequences. The sad fact is that the people most likely to be injured by guns are those who live in a house where guns are kept. I don’t doubt the rights of the owners to have those guns, but do think it is unfortunate that something in our culture leads Americans to, as you put it, shoot first and ask questions later. @l0311879l – Glad you found the post a positive addition to the discussion. I agree that there are a lot of other factors contributing to the high levels of gun violence that we need to research and address. From poor services for those with mental health issues to media that is increasingly divisive to video games and television shows that sensationalize gun violence, there are many potential ways we could strengthen our society and increase our safety, all at the same time. @ElusiveWords – From what I’ve read, most studies show that legal gun owners are more law-abiding than the average citizen, so I’m not sure that most gun owners are claiming they should be able to do whatever they want with a gun. I do think that the discussion is being dominated by extreme voices, ones that push an agenda fueled by paranoia of a totalitarian governement. It is hard to have a rational conversation about gun safety when that is the dominating background noise. @beowulf222 – All interesting points. There are aspects of the US culture that lead us to revere the 230+ year old Constitution as a quasi-divine document, one that needs no updating or reading within a contemporary context. A recent interview I heard was with an author who proposes that every twenty years or so, the entire constitution should be put up for a vote, article by article. That way we have a chance to revisit the relevance of each article and update it as necessary. I could get behind that idea. @whyzat – I know, crazy sane, huh? =D@npr32486 – I was especially curious what your opinion would be as a member of our military. @slmret – Thank you. I suspect a lot of readers already share a similar perspective but I felt like it is important to contribute to the discussion in a constructive manner. I very much enjoyed your post. You do realise that handguns account for more deaths than “assault” rifles, right? I put that in quotations as the “assault” rifle that is sold to civilians is not what the military is issued. People do not understand guns…. I tell you, my 13-year-old owns an “assault” rifle. He is also a responsible young boy who has had several hours of training.For me the issue is quite simple. 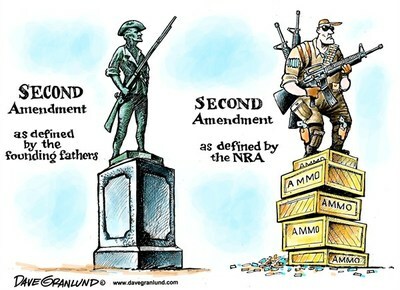 The very reason for the 2nd amendment was to guard against tyranny. Unfortunately, I believe most people do not know history or they are too apathetic to recall it. I hope I have not offended you, sweet Chris. I have come back several times to read what you posted here and it was very well said. I do not have a whole lot to say about the whole issue as I feel it is a loss and the govt is going to do what it wants to do no matter how many more are killed.I had a concealed weapons permit, a small pistol, and took classes and practiced at the gun range. I also had quite a few marksman badges. I have also been a member of the NRA in the past until it became radical and my beliefs were no longer the same as theirs.I gave up my permit and gun, due to my husbands frontal lobe dementia and impulsive behavior and no knowledge of what he is doing when he is in an episode.I believe in the right to bear arms and know I probably spelled that wrong<:)I am concerned about the nut cases who get their hands on guns no matter what law is passed and no matter what the govt does. I say nut cases because someone who goes into a school and kills those innocent children has got to be a nut case.I do not think I have added a lot to this discussion and I really have no answers. @christao408 – Gun control is not the answer. It has been proven not to work. The answer lies in mental health treatment and universal background checks, along with proper firearms training. There is far too much ignorance regarding guns and “assault weapons” or “military features.” It’s stupid to think that having rails on a gun will make it more deadly. It is also stupid to think certain guns should be outlawed; a .22LR is just as deadly as a .223 or .308. Outlawing guns only takes guns away from lawful gun owners. Last time I checked, guns were not permitted on school grounds where shootings occur but wait! Criminals don’t care. Guns have a lot of legitimate uses from hunting, to self-defense to recreation. Infringing upon the right to bear arms is unconstitutional. These rights should come with responsibilities, but limiting magazine capacities or features realistically will not do anything to curb gun violence. @Kellsbella – No, not offended at all. There is plenty of room for us to disagree on issues and when it comes to history, people can read the same history and draw different, legitimate conclusions. For example, I do not see any real threat of tyranny from the US government. That said, I also think that people should continue to have the right to own guns but with a more thorough system of background checks to reduce the risk of them being obtained by people who should not have them. While we may not see eye to eye, I do appreciate your participation in a constructive and civil conversation! @npr32486 – Which is why I wrote that I’m not in favor of banning particular types of guns or magazines.We are in agreement on this point. Thank you very much for elaborating on your position. As a member of the armed forces, I think your two cents’ worth is very valuable. @Grannys_Place – I think you have added a great deal to the discussion, especially capturing the feelings that many people have that there are no easy answers to this complex issue. Thanks for sharing your perspective. @npr32486 – Absolutely, and it is appreciated. You are up kind of late, though! @beowulf222 – The US Constitution has an amendment procedure. If it needs updating, use it. Imposing things by executive fiat in defiance of the Constitution kind of wrecks the whole system. Overall a well thought out post. I’m wondering where you got the 60% figure re the background checks? Doesn’t seem right to me as any purchase through a licensed dealer has to have a background check. The big problem with background checks is how do you flag the potential problem individuals? The kid shot up VA Tech passed the background checks. He was known to be a troubled, but no one followed through to flag him as such. Giving him a break or trying to avoid liability? Who knows? Going after the “straw men” is a good idea. We do it with people who purchase booze for underage kids, why not guns for those ineligible to buy them? Not sure requiring all private transactions to have a background check is a good idea. Maybe those at gun shows (people likely to be doing it commercially but at a low enough level not to need an FFL), but do I really have to go through a bunch of bureaucratic crap to buy grandpa’s shotgun from my uncle? The speeding analogy doesn’t work for me. Speeders typically aren’t willing to die to go 20 mph over the speed limit. Murderers often are willing to die to achieve their ends. The prospect of a gun control violation is not likely to deter someone who is willing to commit a murder. When it comes to deterring a certain behavior, the only real correlation is the likelihood of being caught. If you are willing to die anyway, even the death penalty is no deterrent. The “assault weapons” thing is a canard. They have no performance advantage over many other semi auto firearms, they just look scary. They are also a very small percentage of the firearms used in criminal activity in the US. We need to adjust some things, but it needs to be something that actually makes a difference, not just a bunch of feel good crap that needlessly burdens people who aren’t a problem. @Toro69 – Thank you for catching that 60% figure. I originally wrote the sentence the other way around – “only about sixty percent of gun sales happen with a background check” – but then I turned it around but didn’t fix the statistic. I’ll edit that in a moment, as soon as I type this comment. The figure of the sales that do not have background checks includes many gun show sales and also private sales. As for where that figure comes from, it is an interesting one that dates back to studies from the late 1990s. It comes under some scrutiny (see here and here) and should more accurately be cited as “an estimated 30 to 40 percent” although as the Washington Post notes, efforts by foes of gun control have squashed research that would provide us with more accurate and up-to-date numbers.Universal background checks won’t stop everyone, that’s true, and the system that feeds data into the background check database needs to be more robust, so that people with possible mental health issues are flagged. That said, I see universal background checks as one of the least intrusive ways to improve gun safety while maintaining ownership rights. @Toro69 – And it seems that presidents of both parties are using executive orders with greater frequency. Of course, considering how gridlocked congress is, I’m not that surprised. very good i find that countries that don’t have guns don’t have as much violent crime and those that do are out of control. @grannykaren – Generally true but there are some wide discrepancies. Gun ownership rates do not always correspond with rates of gun violence. Every time the subject of guns comes up in a blog I read, which is understandably quite often seeing as the majority of the blogs are American and recent tragedies have thrown the subject into the headlines worldwide, the over-whelming emotion I experience is relief that I live in a country where gun ownership is legally in a tiny minority and illegally (hopefully) an even small minority. Naturally there are areas of the country where the police are armed but other than those places they are not. I’m not sure I would feel safe in a country where I might be caught in the cross-fire from an incident where someone whips out a weapon only for many others to the same. But I think that gun ownership is too entrenched in US history, in the psyche of the nation and it will be impossible to eradicate it. Perhaps there will be a possibility of more rigorous controls but the fact that the weapons are already out there in their thousands will mean that a great many of them just mysteriously disappear… I wouldn’t want out police to be armed. It would undoubtedly encourage more armament among the criminal fraternity; an arms race on a small scale. I’m not naive enough to think that gun crime never happens here, indeed there have been some awful tragedies but it is thankfully a rarity and I hope the absence of legal, household gun ownership is something I never see here in my lifetime. @holeinyoursoul – Thanks for adding your comments. When I write about US-centric topics, I cringe a bit knowing that plenty of people on Xanga are not from the US and don’t really care to read about our domestic affairs! The gun culture of the US is so deeply entrenched that I suspect we will never see any significant change in it. As for the fear of getting caught in the crossfire, though, perhaps I can provide some peace of mind. According to an article I read in the Guardian, rates of gun violence are much higher in 27 countries than in the United States and all of those countries (including Honduras, El Salvador, South Africa, and Mexico to name a few) have much lower gun ownership rates than the United States. Thanks, Chris….very well done indeed. It’s a tough issue, I know, but I’d be happy to see a ban on the sale or manufacturing of assault type weapons and high capacity ammunition magazines. Enjoyed the graphics too! @Gma_Joyce – Glad you enjoyed the entry. I spent a lot of time on it. Turns out there is no shortage of political cartoons on this issue! well said, chris. i too know a couple of friends whom are gun owners and users. 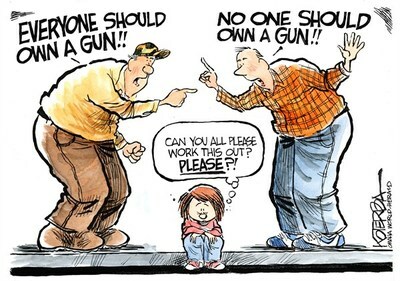 it is true that having a gun doesn’t guarantee one to harm others. it is very much the regulations on the usage that needs changing and updating. 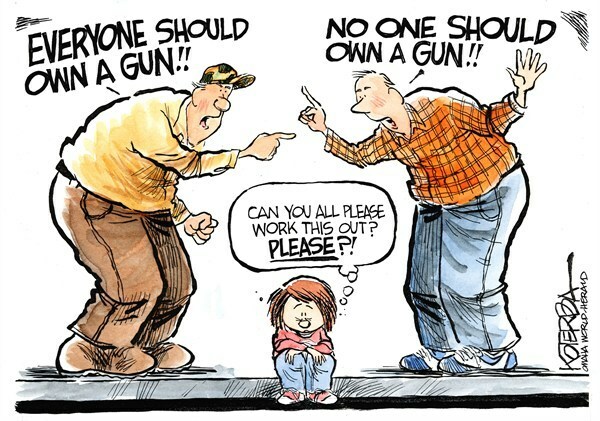 too many gun buyers/owners don’t have the mental health or stability to rightfully own one, let alone use one. let’s hope this issue get resolved fast, for the sake of the innocent people everywhere. Sometimes, I like to go to work and pretend I am in a war zone.I constantly take covers to my way to work.Yes, it freaks people out, but I feel awesome, like I am in a spy movie.It’s never too early to be prepared for gun violence.